Our relationship with water is primal. For animals of all kinds, water signifies survival: somewhere you can stay, somewhere that offers sustenance, not just for you but for the plant life that can help support you and the trees that give you shelter. Through the ages our relationship has evolved. A connection to the sea or its tributaries was usually exploited as a means of fishing, of transport, creating trading opportunities and exposure to other people and cultures. In the past two centuries, in Europe, trade and industry has dominated our waterways, with the Industrial Revolution bringing a new zeal for constructing canals, and placing manufacturing next to rivers in order to harness water as an ingredient and then a place to discharge the resulting toxic effluents. Small wonder that when London’s Royal Festival Hall and the Southbank Centre were built in the mid-20th century, they faced away from the river – at that time, the river was a noisy, smelly thoroughfare, London’s docks still thriving, and the idea of the popular riverside promenade that now runs for miles along the Thames’ Southbank was half a century in the future. It’s extraordinary to think that, when Frank Gehry’s Guggenheim Bilbao was proposed 30 years ago – as a voluptuous gesture, a major civic temple to contemporary art in the city’s most prominent, but as yet unlovely and formerly industrial, waterfront location – it was seen as a radical and risky proposal. Fast forward to 2017 and there’s been a huge revival in water’s fortunes as a focal point for almost any activity. Long neglected open air lidos are being restored or disinterred, sauna and steam venues are popping up in unlikely urban quarters, and new cultural venues are taking shape on waterfronts all over the world, from Dundee to Dohar. Leisure amusements have been conjured up whose appeal is based entirely on their watery location – from Brighton’s i360 seafront lookout tower to Singapore’s Gardens by the Bay. A waterfront site is a dream commission for any architect: the chance to do something sculptural and striking against that vast and shimmering backdrop, knowing that the setting will endure – and hopefully remain clear of the cluster of cranes and cheap construction that can end up dwarfing many more inland landmark buildings, once the regeneration rollercoaster hits town. It’s not just the light and liquidity of water that attracts, says architect Anna Liu, it’s also sound – the sound of water has been a calming, inspiring element in garden design for centuries; beloved of the Feng Shui brigade – a spatial philosophy that follows certain formulae for the arrangement of elements and materials to enhance prosperity and wellbeing - water has long been a source of spiritual solace. With its marriage of landscape design and architecture disciplines, underpinned by a fascination with biomimicry, it’s not surprising that her practice, Tonkin Liu, should be particularly attuned to the use of natural elements within and around a building. The practice is currently designing an uplifting home in Malaga, on Spain’s costa del Sol, where they have broken up what would have been one huge house into disparate segments, united by a continuous central spine, and with each segment interspersed with water of some kind, from shallow pool to lap pool. This not only brings the tranquil light and reflective elements of water into the house, but also cools the breeze as it blows across the pools, bringing welcome wafts of chilly air into the house during the hottest months. Most recently, however, they have completed an inspirational conversion of their back garden in the Georgian house that is both home and workplace, in Islington. The Sun Rain Room is an ingenious expression of landscape design, art, architecture and engineering, transforming the central courtyard into a small rainwater pool during a downpour. A whole level below the small backyard was excavated to create a new extension for the basement-floor apartment, topped by a sculptural outdoor space whose form and materials create an immersive experience that enriches all weather conditions, but especially rain. Rainwater is collected from the four-storey building’s roof and funnelled down the sides in drainpipes that hug the elliptical edges of the pergola that fringes the courtyard. The rain pours into flower-filled planters and into a large black tank that runs along the courtyard’s left-hand side. During a downpour, rainwater overflows and spills into a tray placed below the black granite tiles, which then fills up through the perimeter grille and turns the courtyard into a reflecting pool. Finding novel ways to bring water into the home or office environment is clearly a trend: young practice Feilden Fowles has added an unusual feature in its new office – a handsome glass-and-wood temporary pavilion constructed on the edge of an urban farm – by removing guttering from the roof’s edge and allowing water to pour down from this edge and on to a stone-paved ledge that surrounds the building with a drain at its edge. The effect is apparently spectacular in a downpour. The choice of materials to enhance a waterside setting are evolving too, beyond the more obvious charms of voluptuous titanium tiled curves, such as Frank Gehry’s Guggenheims (both Biblao’s and the proposed Abu Dhabi’s). Carmody Groarke is just finishing the new Windermere Boat Museum, whose buildings are clad in oxidised copper, a material that offers a subtle shimmer, plus a patination that will only get richer with age, blending the complex more beautifully into the iconic landscape. On Scotland’s east coast, Kengo Kuma’s V&A Dundee is slowly revealing its dark, ship-like form but its facade is layered with concrete bars embedded with quartzite, so that they will pick up the shimmer of sun or moon on the water. As the building nears completion in 2018, the ground at the front of the building will be excavated, and a black-lined trough sunk around its edges to immerse the building in the waters of the River Tay; the effect of the black trough is to make these actually quite shallow perimeter depths appear fathomless. Brighton’s crumbling West Pier was dubbed ‘untouchable’ since arsonists gutted the pier in 2003, until Marks Barfield, the husband-and-wife team behind the London Eye, revealed its ambitious i360 observation tower to general applause in 2016. Wanting to replicate the slow ascent and birds-eye view of the London Eye, but on a smaller budget, planning permission was received in 2006 for a 162m-tall, aluminium-clad lookout tower up which a glazed lookout pod was proposed to travel, but construction was scuppered by the global financial crisis. 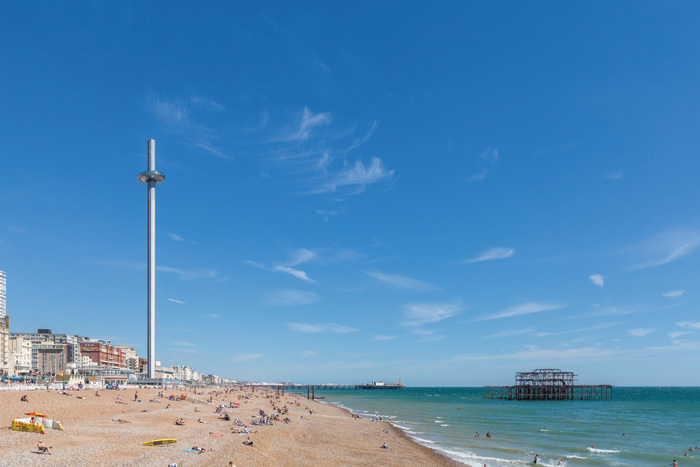 It was rescued by a private-public funding partnership between Brighton and Hove Council and British Airways, which retain the naming rights. Opened in July 2016, the British Airways i360 is a modern-day vertical pier, designed to entertain and inspire. It took two years to construct, with a multitude of innovative engineering achievements: it is the world’s most slender tower, with a height to width ratio of more than 40:1. It uses state-of-the-art cable car technology to drive the pod up and down, and the energy for the upwards movement is generated by power harvested on its descent. The perforated aluminium cladding around the tower diffuses and disrupts the flow of wind by allowing some to permeate through the structure. Dampers are installed inside the tower to prevent vibrations and also inside the pod, which is aerodynamically shaped for the least wind resistance. As for the visitors, at a cost of £15 a head (half price to locals), it transports 200 passengers at a time at a speed of 0.4m per second (less than 1mph) in a ride that takes 20 minutes to reach the top. The viewing distance is 20 miles, across Regency Brighton, the South Downs, the English Channel and the South coast. A restaurant, tea-room, hospitality rooms and a shop sit at the base. There have been a few glitches, however: in September 2016, visitors were stranded part way up the structure for two hours; later on more were stuck at ground level after problems with door sensors. It was closed for four days in March. But tickets are valid for three months and the i360 was fully functional as time of writing. The city of Bath was built on water – its fortunes as a destination founded on the natural hot springs the Romans discovered there, and its trade routes enriched by the river Avon, which threads its way through the city centre. However, for centuries, all but the most picturesque stretch where the Grade I listed, Robert Adam-designed Pulteney Bridge extends its shop-festooned, limestone limbs across the river, has been ignored. 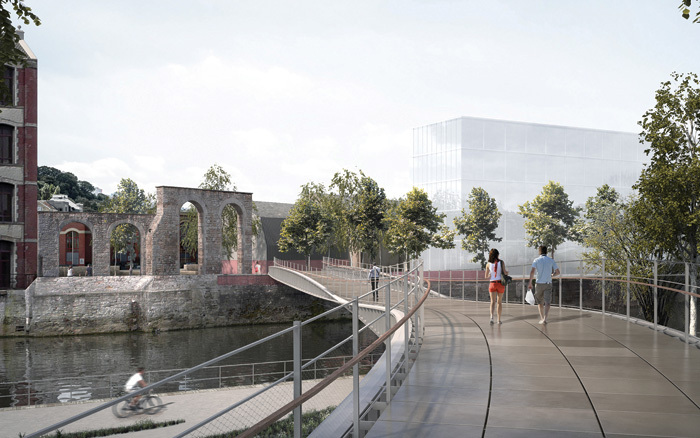 Bath and North East Somerset Council’s current regeneration plan hopes to put that right, re-orientating this popular tourist city to the river with a number of landscaping and infrastructure initiatives along the 98ha of riverside land within this UNESCO-protected city during the next 15 years. One of the flagship projects is a featherweight new footbridge, Bath Quays Bridge, by French engineer/architect Marc Mimram – the River Avon’s first new crossing in well over a century. The thin steel structure of this 65m-long cycle and foot bridge, with its reinforced stone slab deck, follows the curve of a footpath towards the river’s edge, landing – as if thrown, like a rope – slightly upstream on the opposite shore. Its design is expressed in a series of long, curving lines, articulating the engineering that supports the structure with the minimum of material. The lines at the edges of the deck will be illuminated at night by a continuous beam of light integrated in the railings. From above, in profile and as a pedestrian, it will feel like an expression of the natural topography of the river and its bank. 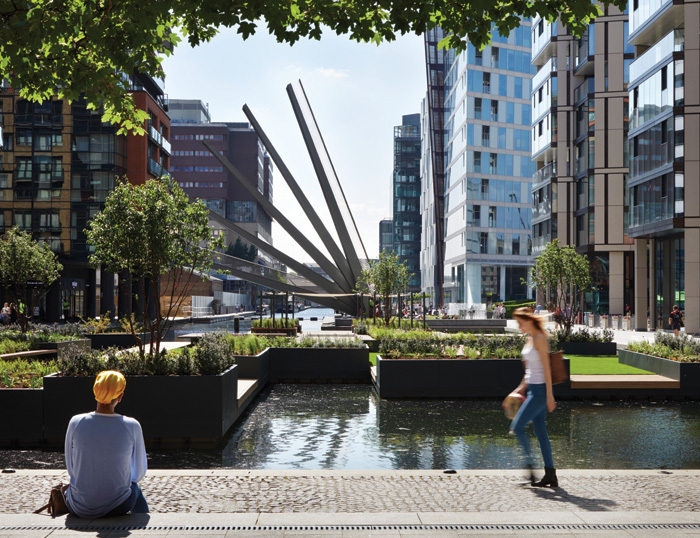 Merchant Square in Paddington is home to London’s first Floating Pocket Park. Designed by emerging landscape designer Tony Woods – a Chelsea Flower Show Gold Medalist and winner of the Royal Horticultural Society’s Young Garden Designer of the Year – the park allows people to walk over the water on a series of decked platforms and walkways to sit and enjoy the views and wildlife. Large planters are filled with a mix of wind tolerant grasses that will add the pleasing sound of their swish and rustle in the breeze, as well as nectar-rich lowers such as allium and salvia to attract bees and other insects. An independent wildlife island is planted with native waterside plants, to encourage birds and waterfowl to feed and nest. A contemporary shelter provides shade for plants and visitors as well as a potential event space. Conceived and funded by developer European Land and Property, creator of Merchant Square’s 11-acre, canal-side neighbourhood, it forms part of the Greater London Authority’s ‘green infrastructure’ programme to improve and connect the city’s streets, squares, parks and canal and riverside spaces. There are times when the best course of action is no building at all. Dalieh represents the last piece of undeveloped seafront in the Lebanese capital Beirut. The Lebanese civil war (1975 – 1990) destroyed much of the fabric and heritage of the city, but seemed to spark a frenzy of development – a perhaps understandable urge on the citizens’ part to assert its life-force through construction – but which saw huge areas of coastline illegally developed as resorts and holiday apartments. But four years ago, when Dalieh’s distinctively rocky profile was proposed as the site of a high-end OMA-designed resort, a collective of 10 architects, urbanists, landscape designers and writers were having none of it. They launched the Save Dalieh campaign and began a programme of consciousness-raising and gentle but persistent lobbying to highlight the illegality of the proposal, petitioning government and heritage organisations, staging exhibitions and interventions and hosting walking tours. It wasn’t entirely successful: a fishing community that had made its home there over centuries was removed in one violent attempt at clearance, which ultimately failed. The fishing – in Beirut’s oldest known fishing harbour dating back a few thousand years – continues. 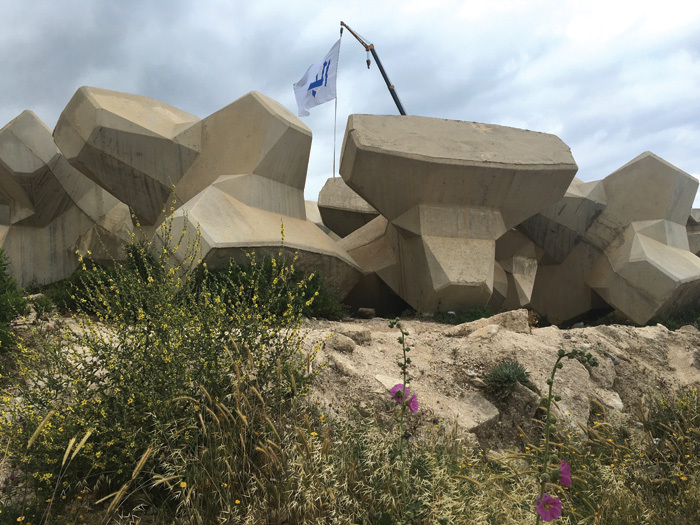 An attempt to build a marina with huge cement Acropods was also thwarted, and these large, strangely appealing shapes have now been appropriated by the activists. For Beirut Design Week in May 2017, a public art intervention drew further crowds and support for their cause. Artworks included: a fluttering blue flag, posted by the Acropods, declaring simply ‘the sea’ in blue Arabic lettering; a sound work comprising recordings made underwater in and around that coastline, including the clattering of crab claws and the squealing of bats who live in Dalieh’s caves; a wooden sculpture inspired by the aforementioned Acropods; and the temporary installation of ‘Dalieh’s infinity pool’, filled with seawater, right on the sea’s edge. Thanks to the efforts of campaigners, Dalieh is now on the World Heritage Watch list, and they have joined forces with other pressure groups to form the Coastal Coalition.